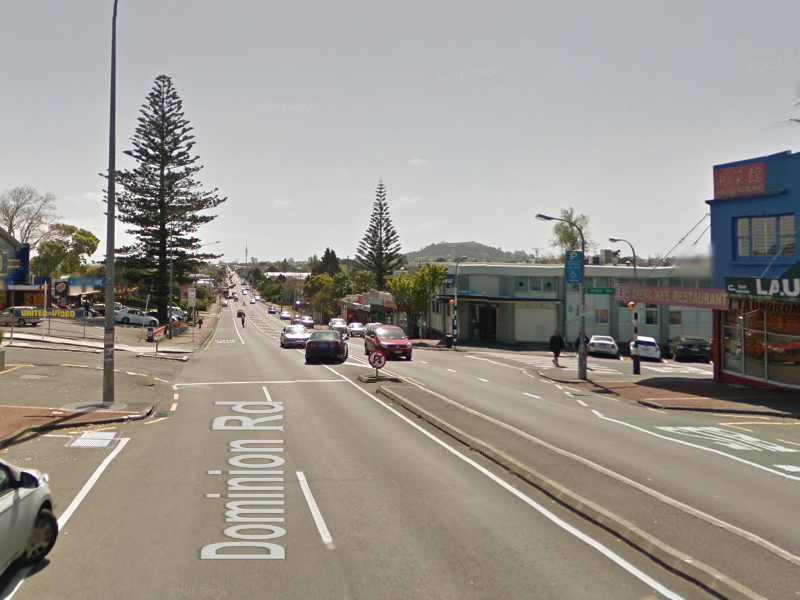 Dominion Rd is one of the city’s busiest and most important bus routes accounting for almost 3 million trips annually. At peak times it already sees many more people on buses than in cars – Auckland Transport saying 23% more. The future of Dominion Rd is for light rail. However, while that’s very much needed, one of the causalities of the push for it has been any improvements to the bus lanes to improve transport in the interim. Planned improvements had been on the cusp of happening many times in the past, only to be delayed again and again. In some ways it was understandable to put the last lot of plans on hold, AT had hoped to be putting rails in the ground by now. But after it quickly became clear that the debate over light rail wasn’t going to be a fast one, AT should have got on bus lane improvements. It looks like Auckland Transport are finally going to do that, announcing yesterday that they’ll starting soon. Early next year Auckland Transport (AT) will extend the lanes to make them continuous between Horopito Street and Mt Albert Road. They will also operate for an extra hour in the mornings and evenings. The city-bound bus lane will be open from 7am to 10am and south-bound lane from 4pm to 7pm. Bus lanes can be used by buses, bikes, motorbikes and mopeds during the restriction times. These improvements will help ease congestion in peak hours allowing fast and frequent bus services, making public transport an attractive option. The main cause of congestion is private vehicles with one occupant. At the same time that the bus lanes are extended, AT will move some bus stops to comply better with the standard 400 metres between stops. All bus stops not covered by verandas will have shelters put in. There will also be some changes to pedestrian crossings so people can cross Dominion Road to more easily access bus stops. “These changes will help with traffic flow for all road users. Buses will have a dedicated lane during the weekday peak hours so they won’t have to move in and out of traffic,” says David Nelson, AT’s Group Manager Major Projects. AT has provided information to property owners and occupants directly affected by these upcoming works. 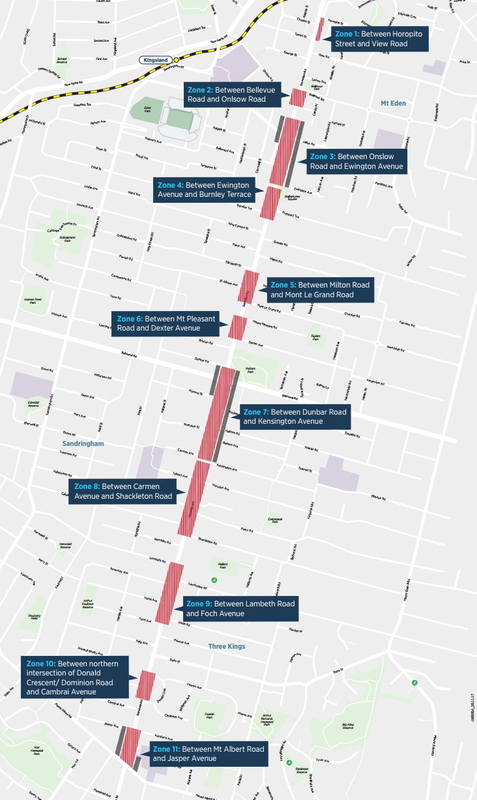 Prior to the works commencing AT will send out information to the entire stretch of Dominion Road between Horopito Street and Mt Albert Road and install road signage. Extended bus lanes that operate for longer and with better stop spacing, finally. It’s fantastic that it’s happening but really should have been done years ago. If you want to know more about what’s planned, including just what stops are planned to be added or removed, there are details on ATs website. The various sections that will see changes are shown below. I counted seven trucks parked in the Queen St bus lanes today. It’s one thing to paint bus lanes, it’s another to actually enforce them. Same goes for clearways, however bus lanes are more often ignored. We need more enforcement, most definitely! A law that is not enforced is not a law at all: merely a ‘suggestion’. One thing the new govt could do quickly is ensure legislation enables bus drivers to record instances of vehicles parking in bus lanes (e.g. using an onboard camera) and then issue fines automatically. I understand this system is used in London, for example. That’s a great idea – Do you know if anybody has mentioned it to an MP? There are several places on Dominion Road that regularly have cars parked in the bus lane. Outside Le Voie Fracaise bakery at 875 Dom Rd I regularly see cars stopped to pickup stuff from there or the shop next door. I suspect some people stop there just about every day without worry of being ticketed. Many cars were parked in driveways and across the new cyclelane in West Lynn yesterday morning at 7 am, each pushing the cyclists into the traffic. Cycleways without enforcement = angry car dependents yet poor amenity for cyclists. Given that road policing seems to get more money each year than public transport funding and waaaay more than walking and cycling funding, you’d think some of that road policing could benefit the users of PT and people who use active modes. One of the most frequent offenders at blocking a 24/7 bus lane is the NZ Bus driver change over cars which stop in the lane outside Victoria Park Markets despite parking spaces directly opposite. Causes congestion for all users, and increases dangers for those on two wheels legitimately using the bus lane. AT enforcement of this is woeful. That car is a nightmare – I have to cycle there regularly and it forces me into general traffic. Yes, this is so obviously part of the set driver protocol yet breaks AT’s rules and endangers cyclists. Needs to be challenged. I’ve challenged AT and NZ Bus over this many times in the past year over the breach on the bus lane and the safety issues it’s causing. AT have been pathetic with actually getting the problem solved. NZ Bus ignore every attempt to discuss with them – simply no response at all. When I raise the issue with AT about one of their contracted operators ignoring queries and complaints, I get zero support at getting anywhere with NZ Bus. Even involving local board and councillors has produced nothing more than a lip-service response from AT. I wonder if there have actually been any crashes as a result? Would be interesting to see what happens to NZ Bus if their standard practice were to injure a cyclist. A side benefit is a little more protection for cyclists – I have an end to end cycle way from work to home except for the Hiropito to View Road section. So thanks from me, AT. This is an interesting problem – and we will have the same problem in Wellington with Lambton Quay and Adelaide Road. So, currently, bus lanes are on the footpath side of the road, with cars going down the middle of the road, right? But in the future, with Light Rail routes, the tracks will go down the centre of the road, correct? Not at the footpath side, but in the centre? So, cars will be on the left of the Rail – assuming that all buses are removed and replaced by rail. That’s fine – very common overseas, with small islands needing to be built to receive passengers. But it is the changeover process that interests me – how to get there? As in, how to get a bus lane on the left to change into a LR down the centre. Logically, probably, you would move the bus lanes over first, to the centre, and build the passenger islands, and then get people used to working with PT in the centre. But then you’d have to close it all off again as they dug up the centre and installed rails. Nightmare. What to do? Ideas? Just keep running the buses kerbside while you build the rail in the centre. Then when you are finished start running the rail, stop running the buses and let cars use the former bus lanes. interestingly enough im told those centre of the road gardens on Lambton Quay still have tram rails buried under them. That will be ironic if they have to remove tram tracks to make way for LR. You’d build it in sections and temporarily close the bus lane in the non peak direction so that the peak buslane can still operate and cars would go around on the other side of the road (barriers in place) while non peak traffic would temporarily use the non peak buslane. Doesn’t actually take that long to lay down concrete and rails, it’s all the other stuff that takes up time. Could probably complete about 70m per day. “Doesn’t actually take that long to lay down concrete and rails”. AKLDUDE is correct, the actual laying of rail is relatively quick as they will come on precast units and laid in place. Its the moving and protecting of services, upgrading of exisiting services and installation of overhead or underground wires that will take the time. Even the prep for precast units shouldn’t take long given that the majority of dominion road is a concrete road. The platforms may need some more prep work however, extra piling etc. The biggest job will be the cut and cover at k-road end. It’s finding and moving the underground services that’s fiddly and time consuming. Send the buses down Customhouse Quay and along the waterfront during construction. Awkwardly discover that this is in fact a much better transit route and forever regret having LR crawl down the golden mile. You can’t move buses to the centre of Dominion Rd as the LR will have fewer stops. If you let people get used to many stops in the centre then it will be impossible to get rid of half of them later. That is how they will make it faster. Reduce the number of stops and make people walk. errr? quite the reverse Russell, 800m to 1km is Rapid Transit standard, 400m is slow bus styles. Are you suggesting we need to add more stops to the Northern Busway and the rail network to make it true mass transit? Combining short and long-distance transit on the same light rail line is a problem with the airport proposal. +1, this is the biggest risk with the LRT. If the public don’t buy into reducing stop spacing it may well ruin the line for residents of the southwest and people headed to the airport. They also need to add bus priority traffic light phasing optimisation. Good to see finally, How’s Mt Eden Rd going? Why bother with “restricted” “extended” bus lane hours at all? Should make them permanent bus lanes i.e. 24×7 because once LR is built, there will be no/zero/nada on street parking along there anyway. So car and delivery drivers need to start getting used to NOT stopping on Dominion Road for any reason. No matter how convenient for them. Best time for that lesson is now rather than once LR begins operating when it won’t just be the folks in the “loser cruisers” who are held up anymore. And also because between now and when LR opens there will be a ton of disruptions and road closures as LR is built, so all the better to make not parking anywhere on Dominion road the “new normal”. That way once the road works begin there will be no dramas, the screaming and shouting by shop keepers will have happened already and no “woe is me, my customers can’t park right outside my shop so I’m going broke” stories we normally see. And also makes enforcement simple – somethings parked in the bus lane that is not a bus – ticket then tow it. Won’t get too many repeat offenders that way once word gets out. Good point. Might as well kill off the businesses now so they can relocate somewhere else sooner. haha the thought dominion road businesses needing doorstep on street parking to survive is hilarious. Yes. I sure hope AT have done some good data collection on people’s assumptions, the reality of how customers arrive, and on how it changes. Would be very useful. That’s something that AT should be doing city-wide as a matter of course. I know that numbers don’t convince people where emotion comes into play, but you need to have the numbers before you can even think of making a proposition. More data is good, as long as they can actually present the data. Ah, the people doing a quick stop in the town for shopping. Contrary to popular belief, doing a quick stop is quite inconvenient by car. Way easier to do on foot, on bike or on a frequent bus route. On the other hand: It’s not just buses which count a ‘loser cruisers’, the streets give us plenty of cues that ‘worthy’ people are not meant to be out there on foot. Auckland is a brutal environment to be outside a car. So don’t be surprised if people prefer a 5 minute drive instead of a 10 minute walk, or if there is some anxiety about having to walk a bit. Yes if walking environment was improved, we wouldn’t even need bus stops every 400m for even the slow bus routes….saving money, time etc while we are at it. Many of the Dominion Rd businesses are restaurants, theatres etc, places people stay for a while. I imagine they would already be broke if they relied on Dominion Rd parking, I’m pretty sure I parked on a side street last time I was over there. Has anyone every actually tried and suceeded parking on Dominion Road itself? Yep, but only after 6 pm . Look for loading zones, unless stated otherwise they only apply mon-sun 8am-6pm. The dreaded “I have to do a tight parallel park in front of a pedestrian audience & while traffic is snarling up behind you and I haven’t done one of these in 3 months” fear. Why now? Isn’t light rail a labour priority? They might be digging it up next year. Do AT know something we don’t? Even if LRT is starting next year, this is well worthwhile. Great to see less bus stops as the closeness and bunching must be affecting travel times. Speeding this up is always the trade off a walking a little further for some. Some are only 150 metres apart. Hopefully the ‘greater good’ approach applies here. It might free up a peak bus or 2 if it saves a few mins travel time – which can be reinvested to provide even more frequency and capacity for customers. “Some are only 150 metres apart” – Yes perhaps the walking is so bad they have done this.